When the clutter gets too much to handle, you need somewhere to store it away, out of sight and away from under your feet. 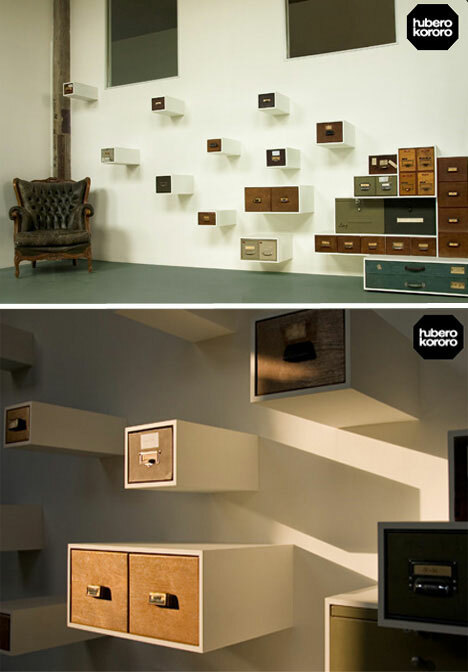 And it would be a shame if the dressers, chests of drawers and cabinets you used weren’t as stylishly and excitingly designed as the rest of your furniture. 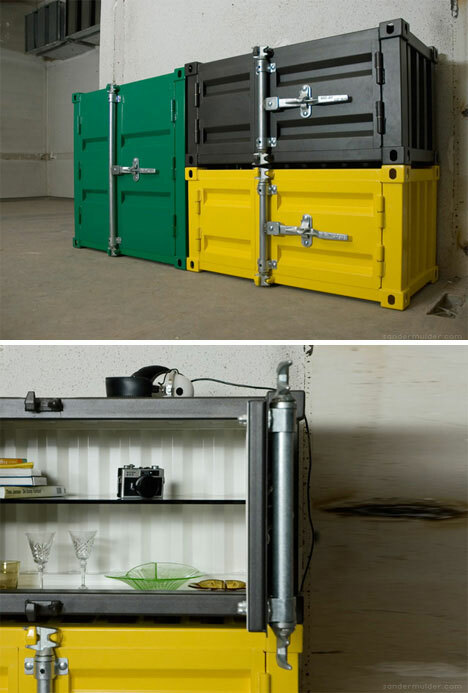 Here are 14 examples of unconventional ways to stow away your belongings. However does it stay up? Details aren’t clear, but we’re presuming that the secret behind the gravity-defying Divided chest of drawers is a wall or a glass support. If it goes commercial, we will discover which. (Or maybe it really is magic). 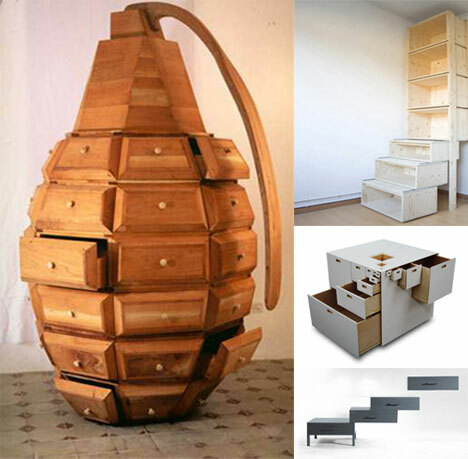 Rather more explicable is the Transformer-Shelf: this nested arrangement of storage spaces can be packed quietly into a corner or artfully opened up in a range of ways. 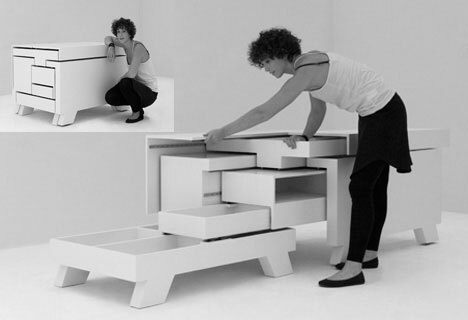 A rare opportunity for your furniture to fit your room, not the other way round. The Pocket Library is primarily for book storage, but its suitcase-like arrangement of straps and compartments will fit all your small item storage needs. One for travel-writers permanently on the go. Somebody at Front Design looked at advertising signs made of tiny turning ‘pixels’, and thought that they’d make a great cupboard. 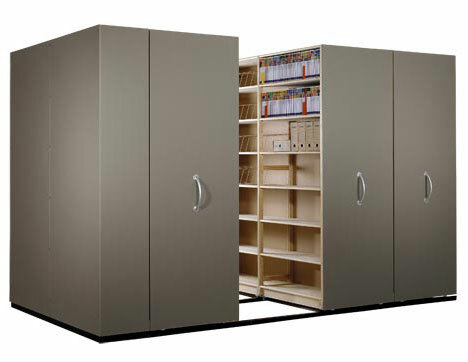 Amazingly, they were right – as the Changing cupboard illustrates. The instructions should probably come with an eye-strain warning, since those patterns look like they might resolve themselves into a picture if you squint hard enough (you could even use it to analyze house-guests, as a party trick). Watch it at work here. Now this is impressive lateral thinking. The corners of our almost invariably rectangular rooms are a waste of space – unless you buy a few of these storage racks. 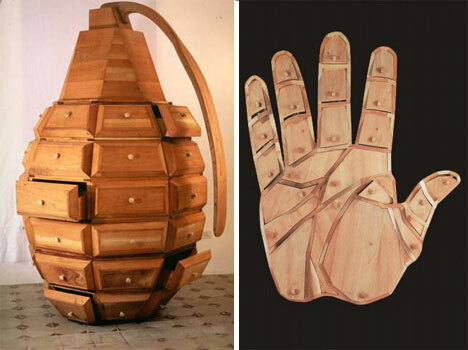 They’re called Punished – to the Corner!, and if your possessions are playing truant, this is what you can do with them. If we have a quibble, it is that there are no details about how firmly they’re affixed into the wall – because one of these landing on your head would be punishing indeed. Who says drawers have to stay in one place? While the drawers of Divided appear to be floating, those of the Drawerment storage system (we can’t really call it a chest) are running amok. 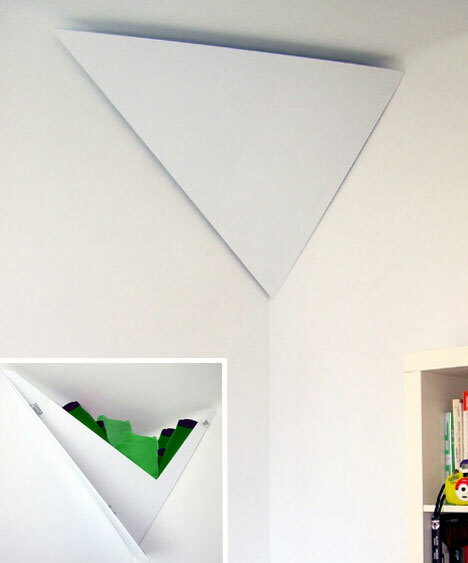 If wall-space isn’t a problem this is a fun alternative to terra firma furniture – and your cat will love it. At the University of Belgrade, students of the Furniture and Interior Design Department have come up with a piece of corner furniture that works in both directions. We’re presuming each drawer has just one side-rail, fixed into alternating sides so that the drawers slide out at ninty-degrees to their upper or lower neighbour. Clever and eyecatching – bravo. 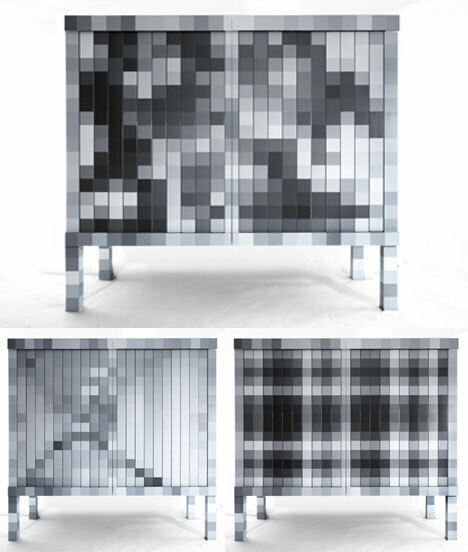 You’d be forgiven for feeling like you’re falling into the Fractal 23 dresser. 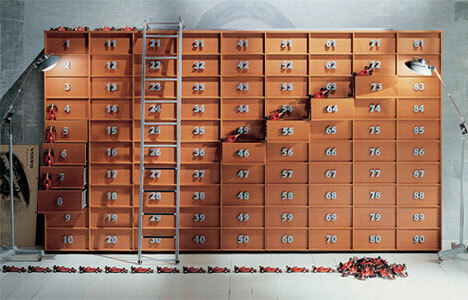 The network of cascaded drawers (23 in number, hence the name) combine from the right angle into the illusion of dizzying depth. 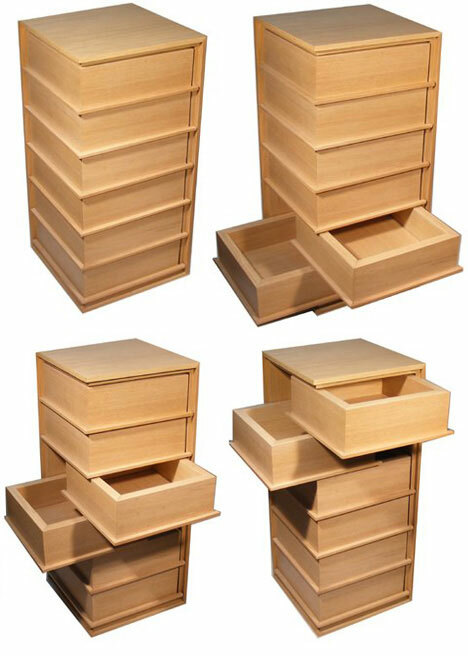 A drawer for every sized item in your home, and a whole new perspective on storage. 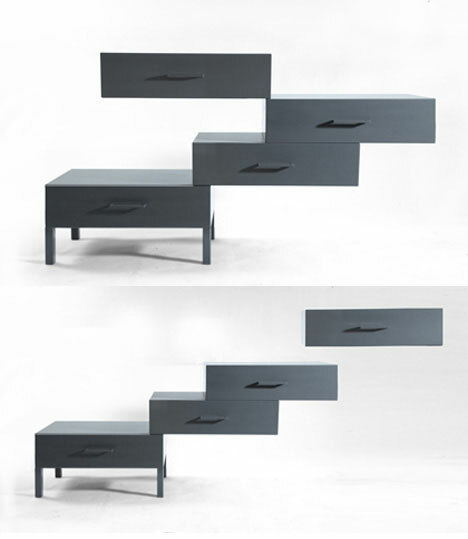 The stairCASE is a tall piece of furniture – and its upper drawers would be inaccessible, were it not for the lower drawers. 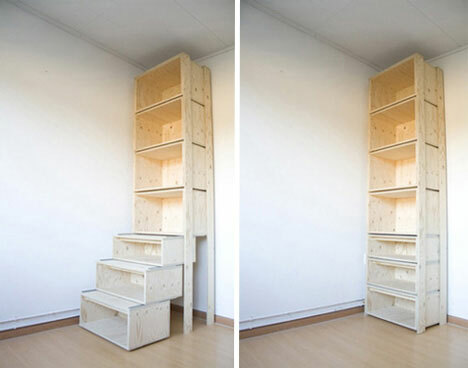 Like the Punished storage bin, this item allows the corners of rooms to be fully utilized – in designer Danny Kuo’s words, “our furniture needs to grow in height in order to be more efficient”. And for existing staircases, there’s this design, a DIY staircase project featured over at Apartment Therapy (with the pictured original being the work of Unicraft Joinery). 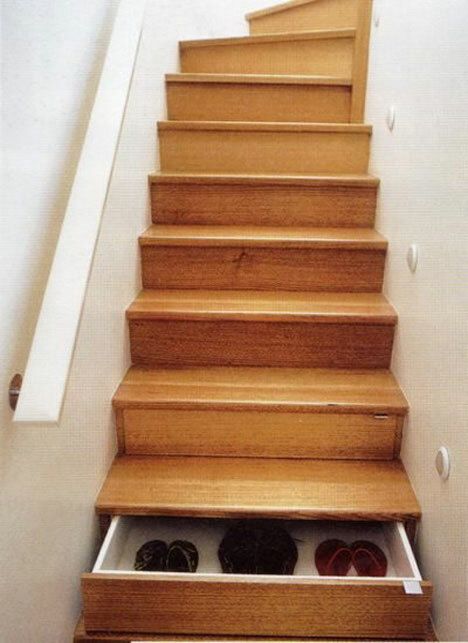 If the staircase in your house starts near the front door, what better place for storing your shoes than a drawer in the bottom step? So where else around the home can drawers be sneaked in? From prefab eco-houses to hotel-building, used shipping containers are all the rage due to their price, ubiquity and versatility. Ugly? Only if you let them be. 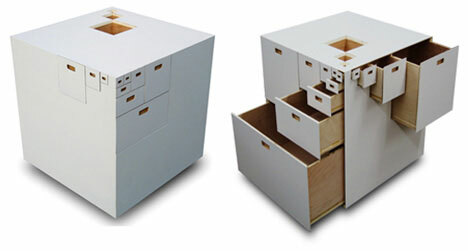 Take the Pandora storage system from Mocoloco – these shipping-style modules have been painted and polished to a shine. (And durability is not a problem). Always forgetting where you put things? This Toolbox chest of drawers might be just the design you need – every numbered drawer could correspond to an entry on a list you have hanging on the wall next to it – and so you’ll never have to search for anything ever again. If you can’t find Emmebi Design’s version (they’ve removed the link from their site), there’s nothing stopping you making your own!